Dr James Morris is a lecturer in digital journalism at City, University of London. Previously, he was course leader for the BA in Web Media Production at Ravensbourne University. He has a PhD in Philosphy, Art and Social Thought from the European Graduate School in Switzerland, a Master's in Media Arts from the New School in New York, USA, and a Bachelor's in Social Anthropology from the London School of Economics. 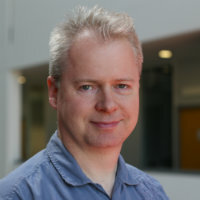 He has worked extensively as a technology journalist, including spending five years as editor of the UK's leading computing magazine, PC Pro. He also runs a successful commercial video and online digital content production company, t-zero communications Ltd, whilst continuing to contribute technology-focused written journalism articles to a number of print and online publications. Dr Morris has also worked on many industry projects, including with the Royal Shakespeare Company and London Symphony Orchestra. For the RSC, he managed the Ravensbourne end of a collaboration where Shakespeare plays are streamed into schools, with the performance of Richard II reaching over 30,000 school students. For the LSO, he developed an experimental video and music website for the St Luke's venue. In February 2017, he created an online experience for the ARIA award-nominated podcast Blood Culture, including an interactive narrative delivered via SMS text message. He is currently working on an art and history video installation, Temporal Chaos, in collaboration with Nanyang Technological University in Singapore and Sunway University in Kuala Lumpur, Malaysia. He presented his ideas on narrative in the digital age at SXSW Interactive in March 2015, and has spoken around the world about his work, including at EVA in Berlin and Florence, as well as the Second Heritage Science Conference in Singapore. His book "Can Computers Create Art?" was published by Atropos Press in 2009. Morris, J. (2009). Can Computers Create Art? Morris, J. (2017). Technologies of engagement: how hybrid networked media is not (just) remediation. Journal of Media Practice, 18(1), pp. 41–50. doi:10.1080/14682753.2017.1305839 . Feinstein, K. and Morris, J. (2016). Developing a narrative experience in a post-media environment. 2016 22nd International Conference on Virtual System & Multimedia (VSMM). doi:10.1109/vsmm.2016.7863180 .